If I remember correctly, this box (which I have 2) came as a gift from a bank with a credit card application. It is not bad even though it is free. The box measures 26 (l) x 12 (w) x 8 (d) cm. 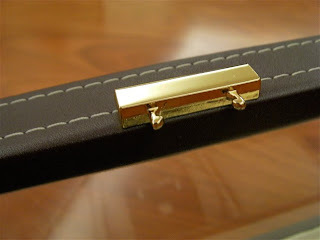 It is brown in colour and the material used is leatherette. The overall finish and quality of the box is good. I like the box. 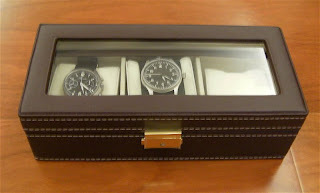 It has a transparent plastic top (very thin) so that you can see the watches inside. 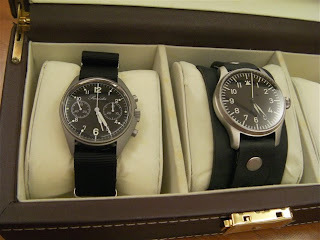 The box takes 3 watches. It is made in China. The box comes with a lock. It is finished in 'gold'. I suspect it is more like polished brass. Anyway the lock is nothing to boast about. 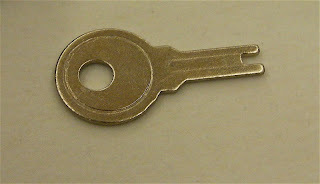 The key is a two pronged key. If you use two toothpicks, you can open the lock. The protective plastic is still on the lock. 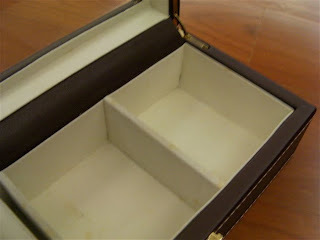 The box is held shut by two 'legs'. 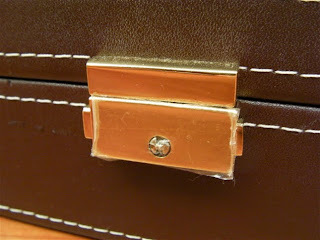 These 'legs', located on the lid is held by the internal mechanism of the lock. It is not the best system in the world, but at least it works. Like I said, the finish and overall quality of the box is not too bad. 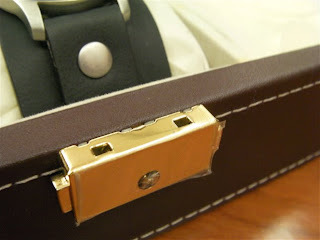 It has external hinges, also finished in gold. 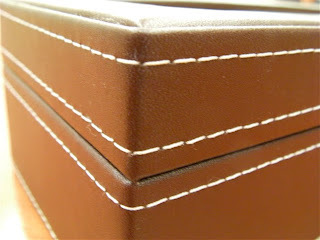 On the inside there are guide angles to make sure the box does not 'twist' when opening or when opened. It is also finished in 'gold'. 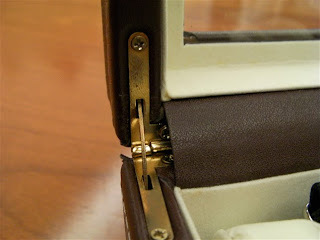 The internal hinge guide. It also acts as a locking device to hold the lid in open position. Sadly it does not work very well. The stitching, in white, gives the box a nice contrast. It is well done. I like it. However I suspect that the stitching is decorative in nature. Now to the important details. 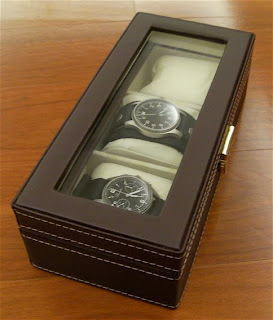 The box can hold three watches. 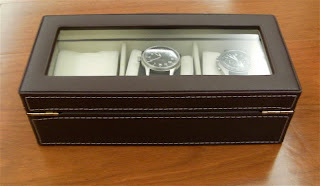 Each watch sits in its own compartment. This prevents the watches from knocking each other. The compartment measures 75 x 92 x 48 mm. It can store big watches. I have tried storing my Invicta, which measures 50 mm across. No problem. The cushion in the compartment. Wish the fit was better. 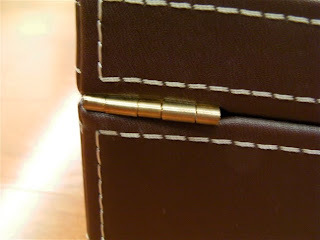 The inside of the compartment is very well lined with a beige velvet like material. Even the compartment divider is thick and robust. All these adds up to a well made box. 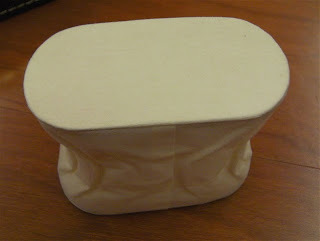 The failing point of the box, other than the lid 'locking' device, is the cushion. It is well lined and is covered with a beige velvet material, but feels thinner as compared to the material used inside the case. 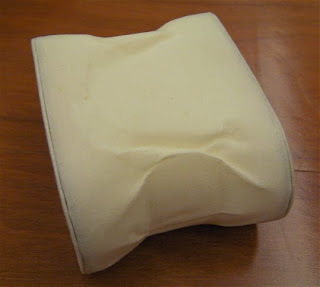 The cushion lacks the correct thickness internal sponge and it is not well made. 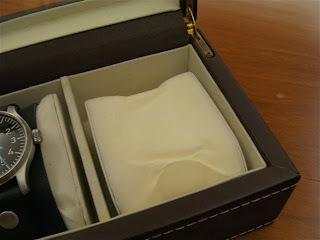 You have this feel that the watch is not 'held' by the cushion. In conclusion I have to say that I can't complain too much. It is a gift and it is free. It serves it purpose and I have to admit that I like it.